Google AdWords is one of the most effective tools you can use to draw in your target audience and convert them into customers. Since each ad is an investment (everytime someone clicks it, you pay), we can safely assume you don't want to do damage by experimenting your way through the setup process. We can also bet you don't have time for lengthy how-to videos. 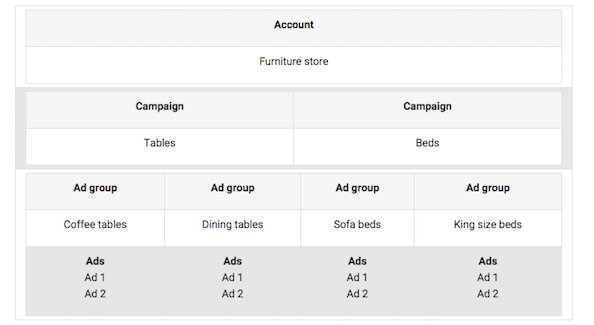 Here's a quick walk-through of an AdWords account setup. 2. 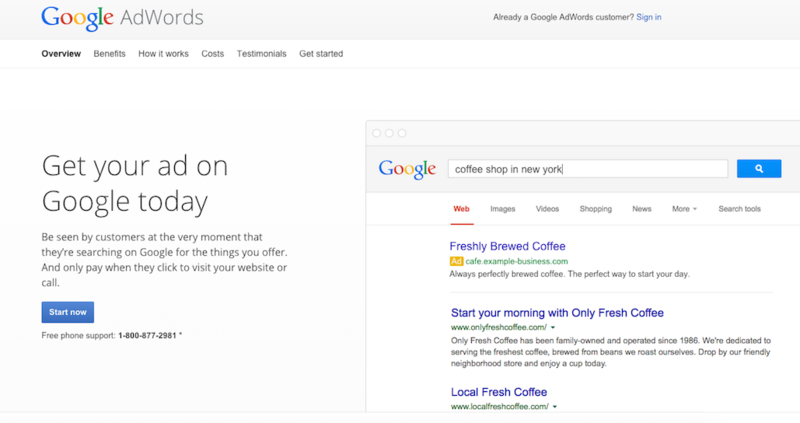 Now, go to google.com/adwords and click the blue "start now" button. They'll first have you enter your email and company website. If you don't have a Google account, they will automatically send you to register at this point. 3. 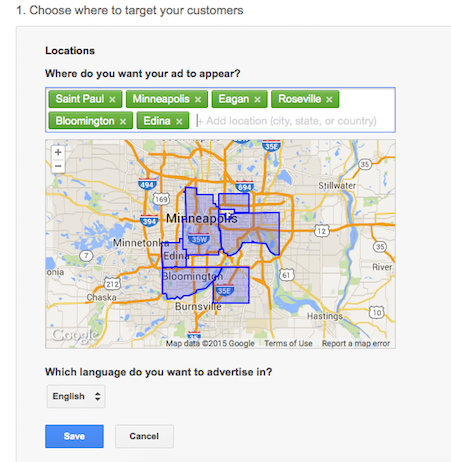 Select the geographic areas in which you want your ads to appear. Be selective; if you don't service outside of your state, don't opt to have your ads appear on computers nationally. The fewer regions you select, the more targeted your audience will be. 4. 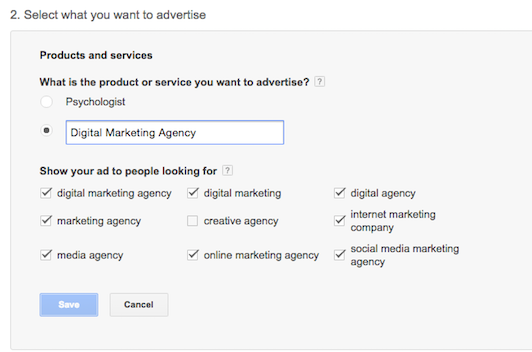 Choose the product or service you wish to advertise and check the boxes for search terms with which your company aligns. For example, ArcStone would call our service a "digital marketing agency" and then select search terms like "marketing agency" and "online marketing." Think about what your ideal customer would type in if they were searching for your service. To aid in this understanding of your audience, use our Audience Persona Builder. You'll want to incorporate searcher behavior in your SEO efforts so also check out "The Silent Hand of SEO." You can build a list of quality keywords through following Google's Best Practices or use a service like sem.rush. Aim for around 20 keywords to optimize your SEO. As you get further into the tool, you can update and test your keywords based on each campaign and your successes. 5. As seen below, they will also have you write your Call to Action, or what searchers will see when your ad is on their screen. You'll type in your headline (what will appear in blue), the link to your landing page, and the wording for your ad. You're limited to a small character count so make it count! 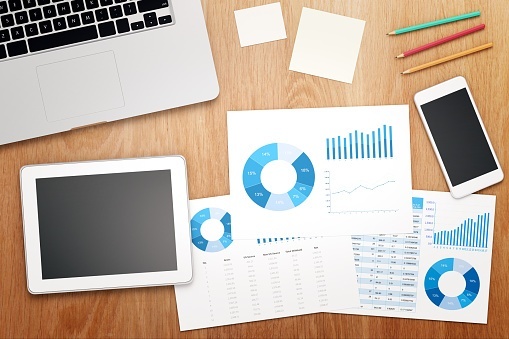 Use clear, action-oriented language to guide your user through the purchasing process. If applicable, use numbers and prices to promote specific deals, making it clear what they are selecting. You also want this ad to be consistent with your landing page so customers can click on it and immediately see what they saught out in their search. Read about a successful CTA in "Creating a Call to Action for Visitors." It's better to link to a landing page rather than just your homepage so that you can get the visitor to a conversion offer faster. Learn about the distinction between website pages in "How Landing Pages Are Different Than Your Homepage." 6. Budget: This number is what tells the system how much you are willing to spend per day on each campaign. For the most part, the ad will run as much as possible per day until this number is met. They ensure that you are never charged more than 30.4 mulitplied by your average daily budget amount. Start somewhere between $20 and $50 per day so you can see how it works in the beginning without investing too much. If you're more focused on measuring effectiveness, you want at least 20 clicks per day which is closer to a $100 per day. 7. Billing: Simply select the method in which you'll pay for your account. You can select "postpay" (automatic payments) or "prepay" (pay manually). If you choose postpay, you can be billed every 30 days or opt to pay whenever your bill reaches the number you set as your threshold for each month. For more information about your options, go to the payment options tool. If you are a nonprofit, Google offers grants depending on your eligibility - read "Google Ad Grants for Nonprofits - Say What?" 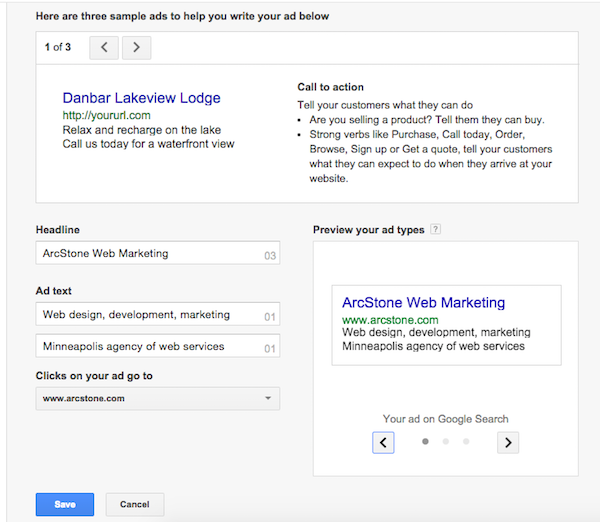 If you want a free audit of your nonprofit's AdWords contact ArcStone. Still want some guidance? We have experts at ArcStone that can lead you through this and monitor your account with you or for you. Be sure to read our eBook "Taking the Plunge into Google AdWords" to dive deeper into more best practices!